CampingTentsDepot.com releases some tips to help make camping more comfortable for the summer season of camping. Our goal is to encourage more people to go camping this summer. 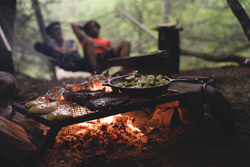 Summertime is the perfect chance to shake things up with summer camping. Many people enjoy the extra light in the day to hike, hunt, fish, or go boating for longer. However, there are more people that don’t enjoy the subtle nuances of being in the great outdoors. There are many issues that people just don’t know how to deal with and that prevents a good number of people from trying the experience altogether. CampingTentsDepot.com, a company that tests and writes informational articles for the latest camping tents on the market has decided to release some expert tips to help new campers bring the comforts of home to their camping experience and avoid some of the annoying aspects, like the insects and other wildlife. Jackson and his team have decades of camping experience between them and are very proud of some of the tips they have created for the general public. Coffee- Coffee is a big part of many American’s routines. One good tip to save on space is to prepackage coffee tea bags from coffee filters and dental floss. That way, people can just drop their bag into a cup with water boiled from the campfire and enjoy some morning Joe. Starting a Fire- Many new campers struggle with starting a fire at first, even with a lighter (bring a stick lighter) something that makes kindling for a fire is actually chips. Bringing along some Doritos and sprinkling them around the wood is a great way to get your fire started. Bathroom- One of the most uncomfortable elements of camping is going to the bathroom. However, people can make a portable toilet with a simple bucket, crate, and the lid to a toilet. The bucket is placed on the ground; the crate is flipped to the inside and covers the bucket. People will then cut a hole in the crate with the toilet lid covering the hole. All three parts can be combined with either duct tape or fastening ties. Insects- Most people hate the idea of bugs crawling into their tent and clothes at night. Many people enjoy the aroma of sage incense sticks, but burning actual sage will keep away those pesky mosquitos. The team at CampingTentsDepot.com hopes that more people will be encouraged to go camping this summer with the main negatives covered by their advice. Jackson also encourages people to visit their site to find reviews and the best prices on new camping tents as well.